"WestEast", for those of us in the decaying rust belt of the United States, is a tantalizing and frustrating magazine. It shows up on the newsstands here less often than its quarterly publication schedule would indicate and the issues that do arrive are full of outstanding photography and graphics. 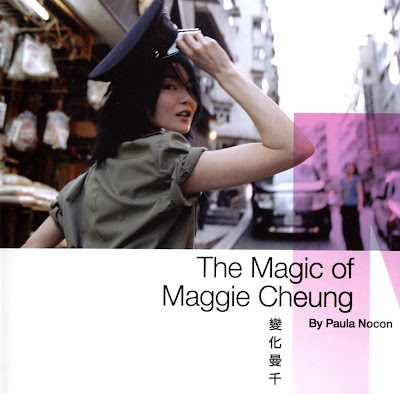 These are images of Maggie Cheung Man-Yuk which I scanned from a 2005 issue, which she guest edited. I don't know what a guest editor of a fashion magazine does other than get her picture on the cover and in a couple of features within--eighteen year-old fashion model Gemma Ward guest edited an issue of Australian Vogue and I think her pictures were in every article with pictures--but it resulted in an article by Maggie on the Hong Kong Tram. She writes that when she was very young in Hong Kong her family lived close enough to the tram line that she could hear the characteristic sound its bell made. Some of the pictures are from a fashion spread, some from a feature of photos of Maggie on the tram plus a few others. 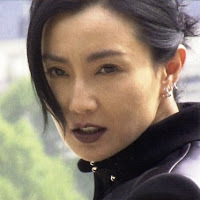 It is difficult for me to judge images of Maggie Cheung since I have been enthralled with her since I first saw her onscreen in the 1988 Wong Jing masterpiece "How to Pick Girls Up", not a vehicle for stardom (or more than a paycheck for a few weeks' work) for any of the actresses involved. Kozo has a good review (which I don't full agree with) at LoveHKFilm . Given my heroine-worship of her I tend to think that any image of the divine Maggie is good although clearly some show her Magginess--to steal a phrase from Brian in his appreciation of her at his invaluable and slightly addictive site--than others. So, here are the pictures that most captured my eye when going through this issue of WestEast. Fan Bing-Bing as Marilyn Monroe? Fan Bing-Bing has done a photoshoot for an upcoming issue of "Esquire" magazine and is, in the breathless prose of both CRIEnglish and sina.com, "the second female star to cover the men's magazine following Zhang Ziyi". According to the same sources the spread is paying homage to the look and style of Marilyn Monroe. It provides the official and semi-official PRC news portals a chance to run pictures of a beautiful actress, an opportunity I of which I am also taking advantage with this post. But there might be a more appropriate bombshell Caucasian actress from the late 1950s and early 1960s with whom to compare Fan Bing-Bing in these pictures. The gray scale images remind me more of Sophia Loren, particularly the last one above. Here is a still from (I am pretty sure) "Yesterday, Today and Tomorrow" of which the picture seems reminiscent. Both involve women getting dressed and both involve mirrors with mirror images. Whatever effect the photographer was trying to accomplish with this image of Fan Bing-Bing he made at least one viewer think immediately of the gorgeous cinema goddess of mid-century Italy although the Chinese idol is not quite as voluptuous as Loren.